Sounds great, doesn’t it? Great, but impossible? Don’t be discouraged, and don’t keep yourself from change by giving up before you begin just because things may not have stuck in the past. The great thing about the new year is it isn’t the past! It’s bright with opportunity. It’s something optimists love, and pessimists tolerate with patronizing indulgence. Change is possible for all of us. The key is to make your resolutions, or things you’ve become resolved and determined to do, into habits. And the key to that is little bites. Too big a bite, and you’ll choke. You need your brain on board for this, not just your body. You probably already know that most of the battle for change is in your head. Creating habits takes the pressure off your brain. Make these things automatic, something your brain doesn’t even have to ponder, and it’ll boost your likelihood of following through. Maybe you want to exercise more this year. You’re not going to start by training for a marathon. Instead, set yourself up for success by finding a way to build a little bit of exercise into your daily routine. Pair it up with your Netflix habit and workout while you binge on your favorite show. That bite-size amount of exercise will leave a good taste in my mouth, helping the next workout time feel more like something you want and less like something you must do. This can be applied to cutting down on sweets or drinking more water. Get your favorite mocha, but get half the syrup in it. Drink more water, but start with just one extra glass a day, and add lemon or lime, or make it carbonated. 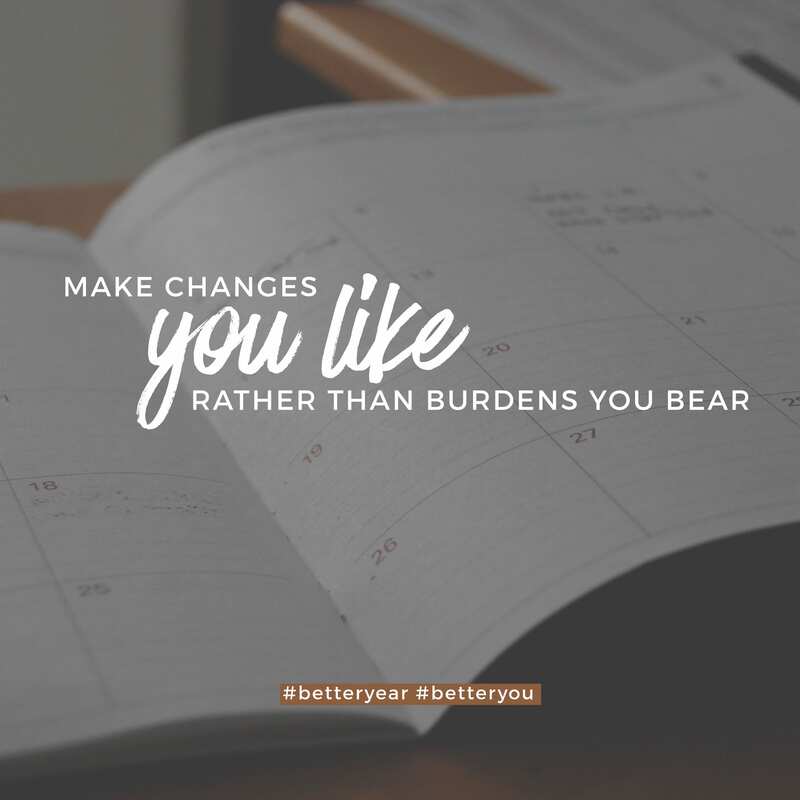 Make changes you like, rather than burdens you bear. This will help in forming good habits. Maybe the habit you need to create is to speak life about yourself. Some parents make their children say something life-giving about themselves when they make a mistake. It’s a small thing, but it makes a big difference. Children then begin to recognize their strengths, and they get in the habit of speaking life to themselves and others. If you feel bad about yourself, if you want to change your outlook for the new year, make a game of finding a positive, or asking whether or not something is live-giving or life-sucking. Keep in mind, if these habits don’t take, you don’t have to wait until 2019 to try again. Failed endeavors don’t make you a failure. Choose to try again. This is a new year, a better year, and an excellent opportunity to become a better you. Next year’s you will thank you for the changes you determine to make. You can do this! Go out there and get it, one bite at a time!